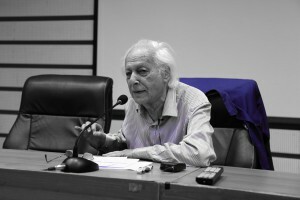 On 1 September 2018, the funeral ceremony of Samir AMIN took place at Père Lachaise Cemetery, Paris. Tributes in French or English were paid to him. The speakers were: Isabelle DE ALMEIDA, Ibrahima THIOUB, Hicham EL MAKOUD, Fatou SOW, Cherif SALIF SY, Bernard FOUNOU, Florian ROCHAT, LAU Kin Chi (in English), Remy HERRERA, Yash TANDON (in English), Taoufik BEN ABDALLAH, Ebrima SALL, Gustave MASSIAH, Aziz FALL, and Erik KOEBE. This recording presents the full funeral proceedings as well as photos of Samir Amin’s activities.